Marsh, James H.. "Maxwell William Ward". The Canadian Encyclopedia, 28 July 2017, Historica Canada. https://www.thecanadianencyclopedia.ca/en/article/maxwell-william-ward. Accessed 20 April 2019. In 1953 Ward formed his company, Wardair Ltd, which pioneered the air transport of heavy equipment to the far North. 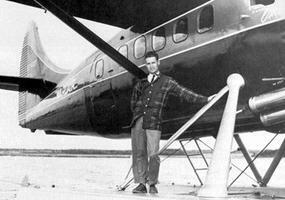 He is shown here in 1953 with a new de Havilland Otter (courtesy Library and Archives Canada/C-60892). 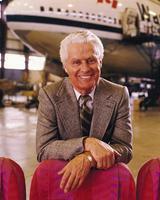 Max Ward at the former Wardair hangar facilities in Toronto, 1987. Wardair was sold to Canadian Airlines and formally ceased operations in 1990 (courtesy Wardair International).